The idea started with Stella McCartney a few seasons ago, but was only recently cemented by the Duchess of Cambridge’s dark blue lace dress during her North America tour. She looked so feminine and elegant in it that my mind started shouting – I want a lacey black dress too! The difficulty of course is to find the right dress in the right style and the right price. Lace dresses are just one of those items that toe the thin line between skanky and stylish. So when I came across this dress at the random boutique in Soho, I was ecstatic. It strikes the perfect balance between lacey and not too revealing. It looks great on as well! I immediately bought it! The one thing is that the skirt part is a little snug and bunches up a bit, which makes me worry that it’ll border on skanky. My friend G suggested I go to a tailor and get it let out. 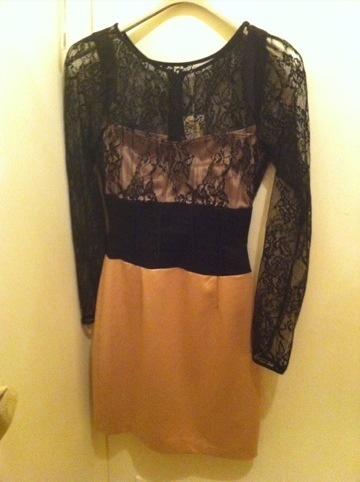 I wonder if that will be worth it… or whether I should save my lace quota for a more Kate-like dress. hey i love this dress …nice styling…i am sure its gonna look really classy when put on…but not sure of the bottom colour..if its a brown or yellow..